Classic Harbor Line Key West and the Schooner America 2.0 are located directly behind the Schooner Wharf Bar. “Key West Bight” where all of the boats and sailing yachts of Key West are located. This is walking distance to the famous Duval Street for after your Sunset Sail, Day Sail or Full Moon Sail with us. Parking is available at a municipal lot on Caroline Street between Margaret and William Streets (to your right as you approach the water at the end of William Street). The parking lot’s phone number is (305) 293-6421. They operate from 7:00 am to 12:00 midnight, 7 days a week. Parking rates are $2.50 per hour or $16.25 maximum per day. Only cash and travelers checks accepted as payment! 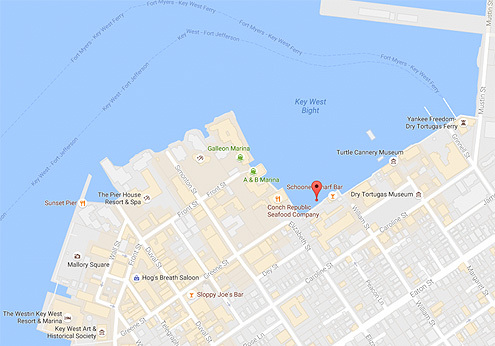 Our Ticket booth is located dockside in front of the well known Schooner Wharf Bar at 202 William Street in Key West, 33040. Our ticket booth is located at the end of William Street. Parking can be found in the municipal lot on Caroline St. If you’re having trouble finding us, please call 305.890.6485.